Arrangements have been concluded for the auditioning of a reality show for startups in Africa. 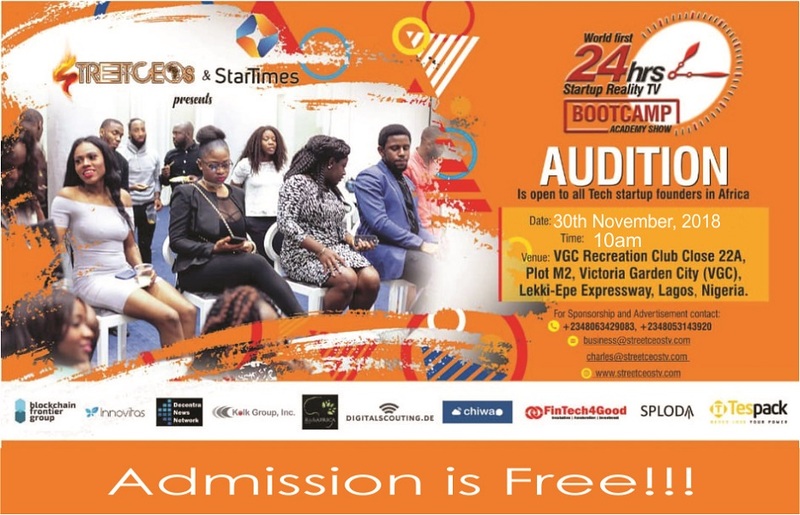 Titled 24hours Startup Reality TV Bootcamp, the show aims at spotting upcoming street CEOs that can be encouraged to reshape the Nigerian economy. According to the main organiser, Charles Idonije, the reality show commences Friday 30th November at the VGC Recreation Club Close 22A, Plot M2, Victoria Garden City, Lagos-Epe expressway, Lagos. Idonije also told National Wire that the Bootcamp is designed to scout out startups in Nigeria and the entire African continent hat can be sponsored to be able to complete on the continent and eventually on the global scene. For enquiries, advert placement, interested participants can contact 08063429083 or business@streetceostv.com.